The Following information was provided by the Outdoor Advertising Association of America (OAAA)..
Consumers spend more time noticing outdoor ads. 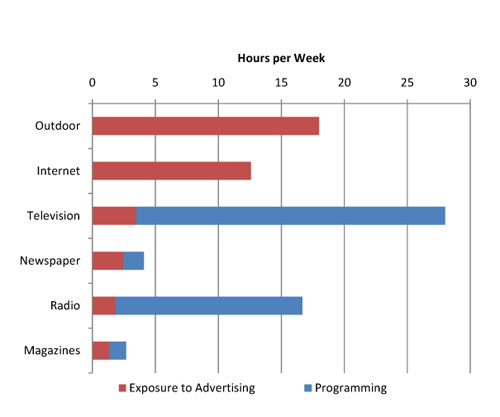 While most people spend more 25 hours each week viewing television programming, their exposure time to advertising is very limited. Nielsen television ratings measure program viewing not commercial viewing. A similar fact is true regarding radio ad exposure. Only outdoor advertising and Internet provide pure advertising exposure. Outdoor advertising is second only to television in total time spent with media each week. But, exposure to outdoor advertising far exceeds exposure to television advertising. Outdoor advertising reaches nearly all (96%) Americans each week, according to a new study released by Arbitron this week. In fact, outdoor’s reach is the highest of any media. This holds true with local advertising media as well. Seventy-one percent of vehicle drivers say they notice billboards, each, most or some of the time that they pass one. Outdoor advertising favors men, middle-aged people, upper-income households and the employed, while television delivers higher concentrations of women, older people and the retired; radio and newspapers draw older consumers. The Internet skews male, young, upper income and employed. People spend more time in their vehicle than they do reading the paper and watching the news. Outdoor advertising has a lower cost per thousand than any other type of advertising. Outdoor ads cost 80% less than television commercials, 60% less than newspaper ads, and 50% less than radio ads. Ads on billboards are free to consumers; you do not have to buy a magazine, cable television, or a newspaper to see your advertisement. Outdoor advertising does not interrupt consumers in any way. There’s no obnoxious sound, smell or other type of negative attention grabber. Billboards are noticed because of their messages, bright bold colors and creative graphics. Three fourths of Americans rely on billboards to find places while they are traveling. Billboards allow you to reach more people faster and easier than any other type of media. Outdoor advertising has a larger audience than any other type of advertising. People are driving further and further every day. Outdoor advertising is the only type of media that has constant exposure. No other type of advertising allows your message to be displayed up to 24 hours a day, seven days a week. Repetition is extremely helpful when you are trying to increase your product awareness, or when you simply want to get your message across to millions of people. This task can easily be accomplished with billboard campaigns. Billboards help increase your products awareness, and knowledge which also increases your sales and profits. Outdoor advertising makes it extremely easy to target, or not to target, a specific market. Outdoor advertising sends us subliminal messages. Billboards are usually the final message we see right before we purchase an item. So why not direct us to your product? The Outdoor Advertising Association of America (OAAA) did a study in 1999 that says people glance at 70% of the billboards they pass. Of these billboards, 63% are actually read. Billboards have been rated higher than any other type of advertising for their ability to communicate ideas at the lowest possible prices. Small businesses benefit the most from billboard advertising. That’s the Power of Outdoor!